Let's say a person is planning to take a plane trip out of the country. And further suppose that individual owes the federal government a fair amount of back taxes. The person may not be able get a passport if he or she owes the government a significant amount of back taxes. The IRS is now reminding taxpayers that legislation passed in 2015 allows the tax agency to revoke passports or deny new ones to major debtors. Has an IRS accepted adjustment that will satisfy the debt in full. Under the Fixing America's Surface Transportation Act of 2015, a highway spending measure, the IRS was granted the authority to notify the State Department about taxpayers who have "seriously delinquent tax debts." The State Department is then tasked with denying the individual their passport application or renewal. It took awhile to put the wheels in motion, but the IRS began enforcing this provision of the law last year. For these purposes, a seriously delinquent tax debt is defined as $50,000 or more, indexed for inflation. The threshold for 2019 is $52,000. This includes back taxes, penalties and interest for which the IRS has filed a tax lien or issued a levy. If a taxpayer is certified as owing a seriously delinquent tax debt, he or she receives a Notice CP508C from the IRS. This notice explains the steps that must be taken to resolve the debt. For instance, IRS representatives may help a taxpayer set up a payment plan or explain other payment alternatives. People who owe back taxes shouldn't delay — especially if they're planning a trip abroad. Once the tax obligations are met, the IRS will reverse the taxpayer's certification within 30 days. Matters may be expedited under certain circumstances. 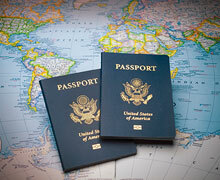 Before denying a passport renewal or new passport application, the State Department will hold a taxpayer's application for 90 days to allow him or her to resolve any erroneous certification issues, make full payment of the tax debt or enter into a satisfactory payment arrangement with the IRS. Have collection suspended because you've made an innocent spouse election or requested innocent spouse relief. The IRS also has provided details on two key relief programs available to taxpayers who could have their passports revoked or denied. 1. Payment agreements. A taxpayer can formally request to use a payment plan by filing Form 9465. This form can be sent with a tax return bill or notice or a taxpayer can arrange a monthly payment agreement online. 2. Offers in compromise. With an OIC, a taxpayer settles up with the IRS for an amount that's less than the actual tax liability. The IRS will examine the individual's income and assets to determine his or her ability to pay. An individual can use an online pre-qualifier to see if he or she is likely to qualify for an OIC. Other special rules apply to taxpayers who are currently serving in a combat zone. Moral of the story: As you can see, there are several available options for avoiding a worst-case scenario. With assistance from a tax advisor, a person who owes back taxes should be able to find a happy tax landing. Summer — the traditional wedding season — is just around the corner. Marriage changes life in many ways. Here's how it may affect your tax situation. Unless you've extended the due date for filing last year's individual federal income tax return to October 17, the filing deadline passed you by in April. 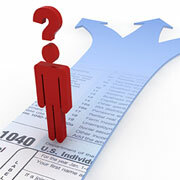 What if you didn't extend and you haven't yet filed your Form 1040? And what if you can't pay your tax bill? This article explains how to handle these situations. "I Didn't File but I Don't Owe"
Let's say you're certain that you don't owe any federal income tax for last year. Maybe you had negative taxable income or paid your fair share via withholding or estimated tax payments. But you didn't file or extend the deadline because you were missing some records, were too busy, or had some other convincing reason (to you) for not meeting the deadline. No problem, since you don't owe — right? Wrong. You may be due a refund. Filing a return gets your money back. Without a return, there is no refund. Until a return is filed, the three-year statute-of-limitations period for the commencement of an IRS audit never gets started. The IRS could then decide to audit your 2015 tax situation five years (or more) from now and hit you with a tax bill plus interest and penalties. By then, you may not be able to prove that you actually owed nothing. In contrast, when you do the smart thing and file a 2015 return showing zero tax due, the government must generally begin any audit within three years. Once the three-year window closes, your 2015 tax year is generally safe from audit, even if the return had problems. If you had a tax loss in 2015, you may be able to carry it back as far as your 2013 tax year and claim refunds for taxes paid in 2013 and/or 2014. However, until you file a 2015 return, your tax loss doesn't officially exist, and no loss carryback refund claims are possible. The bottom line is, you should file a 2015 return, even though you've missed the deadline and believe you don't owe. "I Owe but Don't Have the Dough"
In this situation, there's no excuse for not filing your 2015 return, especially if you obtained a filing extension to October 17. If you did extend, filing your return by October 17 will avoid the 5%-per-month "failure-to-file" penalty. The only cost for failing to pay what you owe is an interest charge. The current rate is a relatively reasonable 0.83% per month, which amounts to a 10% annual rate. This rate can change quarterly, and you'll continue to incur it until you pay up. If you still can't pay when you file by the extended October 17 due date, relax. You can arrange for an installment arrangement (see below). When you file, whichever occurs sooner. While the penalty can't be assessed for more than five months, it can amount to up to 25% of your unpaid tax bill (5 times 5% per month equals 25%). So you can still save some money by filing your 2015 return as soon as possible to cut off the 5%-per-month penalty. Then you'll continue to be charged only the IRS interest rate — currently 0.83% per month — until you pay. If you still don't file your 2015 return, the IRS will be collect the resulting penalty and interest. You'll be charged the failure-to-file penalty until it hits 25% of what you owe. For example, if your unpaid balance is $10,000, you'll rack up monthly failure-to-file penalties of $500 until you max out at $2,500. After that, you'll be charged interest until you settle your account (at the current monthly rate of 0.83%). By now you understand why filing your 2015 return is crucial even if you don't have the money to pay what you owe. But you may ask: When do I have to come up with the balance due? The answer: As soon as possible, if you want to halt the IRS interest charge. If you can borrow at a reasonable rate, you may want to do so and pay off the government, hopefully at the same time you file your return or even sooner if possible. Alternatively, you can usually request permission from the IRS to pay off your bill in installments. This is done by filing a form with your 2015 return. On the form, you suggest your own terms. For example, if you owe $5,000, you might offer to pay $250 on the first of each month. You're supposed to get an answer to your installment payment application within 31 days of filing the form, but it sometimes takes a bit longer. Upon approval, you'll be charged a $120 setup fee or $52 if you agree to automatic withdrawals from your bank account. Approval of your installment payment request is automatic if you owe $10,000 or less (not counting interest or penalties), propose a repayment period of 36 months or less, haven't entered into an earlier installment agreement within the preceding five years, and have filed returns and paid taxes for the preceding five tax years. A streamlined installment payment approval process is available if you owe between $10,001 and $25,000 (including any assessed interest and penalties) and propose a repayment period of 72 months or less. Another streamlined process is available if you owe between $25,001 and $50,000 and propose a repayment period of 72 months or less. However, you must agree to automatic bank withdrawals, and you may have to supply financial information. If you owe $50,000 or less, you can apply for an installment payment arrangement online instead of filing an IRS form. Finally, if you can pay what you owe within 120 days, you can call arrange for an agreement with the IRS and avoid any setup fee. Warning: When you enter into an installment agreement, you must pledge to stay current on your future taxes. The government is willing to help with your 2015 unpaid liability, but it won't agree to defer payments for later years while you're still paying the 2015 tab. You can also pay your federal tax bill with Visa, MasterCard, Discover or American Express. But before pursuing this option, ask about the one-time fee your credit card company will charge and the interest rate. You may find the IRS installment payment program is a better deal. Filing a 2015 federal income return is important even if you believe you don't owe anything or can't pay right now. If you need assistance or want more information, contact your EHTC Tax Adviser. Is this your situation? Just when you thought tax season was over, you receive a notice from the IRS. Don't panic -- you're not alone. The IRS sends millions of notices and letters out each year. Many are computer-generated, because these days, the IRS relies less on employees to get directly involved in issues including collections. Many state and local governments are following suit and sending out more notices to taxpayers. What Does the Federal Government Shutdown Mean for Taxes? As Congress continues to debate the federal government shutdown, the IRS has issued an announcement, providing details about tax filing deadlines, available assistance from the tax agency, and services that will not be accessible until normal operations resume. Continue reading to receive answers to questions you may be asking.